For anyone (male or female) who is unhappy with their body, but doesn’t want to go under the knife there is a solution to remove the fat cells! Coolsculpting® freezes the fat and results are visible within approx. 6 weeks from the treatment. Suzanne Henderson is a Registered General Nurse and a fully Certified Coolsculpting® Practitioner who treats all of her patients personally. Coolsculpting® tackles the areas that diet and exercise just won’t shift, one treatment removes 20 – 40% of fat from the area treated and your body doesn’t replace the fat cells eliminated. The premises are in the prestigious Berkeley Clinic in Glasgow, so really convenient for people working or living in Glasgow City Centre. It is worth mentioning that there are only a few FDA Approved machines in Scotland, Suzanne’s being one of them. Everyone needs to be careful of companies who advertise the same procedure for a cheap price – chances are these are imported machines and we have heard terrible stories about burns, or even the skin breaking, or very badly bruised. 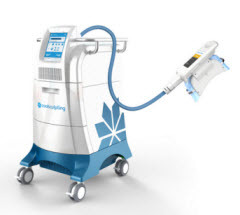 Coolsculpting® is not a weight loss solution for people who are obese, the treatment will be aimed at adults who have diet and exercise resistant pockets of fat (bulges) and who until now, have had to consider forms of liposuction or other minimally invasive methods, to remove these pockets. The procedure is completely non-invasive and successfully helps you lose fat permanently. Coolsculpting® is particularly effective at removing fat around abdominals, over a four to six week period, tummies and love handles are noticeably reduced, the treatment is also suitable for upper arms, inner thighs, back fat and male breast reduction. The treatment is not cheap, but our patients absolutely love the fact that they haven’t had to get liposuction and of course it’s a fraction of the cost. If you are careful about your diet and exercise afterwards, there is no reason for the treated area to store fat again. For the body conscious people, who enjoy taking care of themselves and their appearance this procedure is perfect. The treatment takes just over 1 hour, and as mentioned, the results are visible after approx. 6 weeks. If you are interested in this procedure, please visit the website by clicking here and also look at the Before & After images. These images are actual Patients that Suzanne has treated personally. We are happy to answer any questions you may have, and every single person needs to have a thorough consultation before proceeding with the treatment.